Nissan has announced the 2011 Leaf will carry an EPA rating of 106 MPGe city and 92 MPGe highway. The figures were calculated using the "EPA's formula of 33.7kW-hrs being equivalent to one gallon of gasoline energy." Furthermore, the EPA label reveals the Leaf will have a range of approximately 73 miles (117 km), a recharging time of seven hours (at 240V), and an annual electrical cost of roughly $561. This is a considerable reduction from August 2009 when Nissan used EPA Plug-In guidelines and got a figure of 367 MPG for their all electric Leaf. Based on published data about the Nissan Leaf, a 24 kWh battery that gives 100 miles range, the Leaf can only carry the equivalent of 0.65 gallons of gasoline energy so a more simplified calculation would give the Leaf a rating of 165 MPGe. The EPA Label for the GM Volt has yet to be issued but we're betting it will be too close to call. Taking into account that the US Federal Government is the largest shareholder in GM, it's not much of a stretch of the imagination to see that EPA labels may have become politicized. 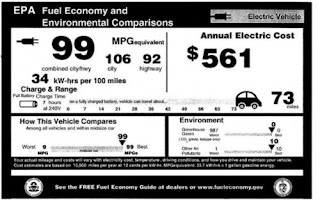 Confirmation of this will be if the Leaf and Volt are both issued 99 MPGe EPA ratings.